As the name suggests, this type of filter construction relies upon the convoluted media to provide an extended surface area as this type of product generally relies upon removal of particulate on he surface layer - so the greater the surface area presented to the fluid the greater the life between cartridge changeout. PREPOR - Prefiltration liquid filters from Parker domnick hunter provide high efficiency removal of spoilage organisms and yeast removal, providing economic stabilisation of your product. BEVPOR - PES membrane range of filters from Parker domnick hunter have been specifically designed for the beverage industry to provide microbial stabilisation that extends shelf-life, while maintaining colour and flavour of the final product. PROCLEAR - filters from parker domnick hunter represent a range of prefiltration and clairification media for particulate removal and bioburden reduction. Designed to minimise throughput in the most demanding applications. 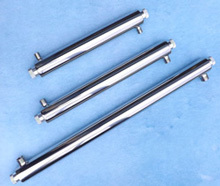 PROPOR - multi format sterile liquid filters from Parker domnick hunter offer a PES membrane which demonstrates low preservative binding and retention of diminutive organisms, coupled with high flow and high capacity performance in critical applications. 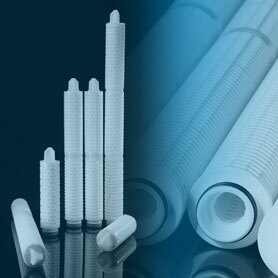 PEPLYN filters from Parker domnick hunter are used for clarification and prefiltration in a wide range of applications. The polypropylene construction makes them the ideal choice for aggressive viscous chemicals and solvents.